It's been a little, too long, but a lot has been going on and I'll have more on the other stuff later. For now though, just wanted to give a quick update to things. I talked about some of this on the stream yesterday but here's a more detailed explaination. My recent neurologist appt resulted in finding out that a lot of things I had been doing are directly related to migraines. Why I avoid bright light, get fatigued quickly in certain lighting, issues with working with older LCD monitors for any length of time, being in places that use various lighting styles, and a whole host of other things...etc. However, it's not just any kind of migraine attack that most folks are used to. I've been diagnosed with Chronic Migraine. This doesn't mean that I suffer from migraine pain all the time, or just have them more frequently, it means that more often than not I'm having a migraine and all the symptoms of them for extended periods of time more than half the month. For me, and many other chronic migraine sufferers, it's just very often with no pain but still with everything else that goes with them to varying levels depending on the attack. There isn't a cure, just management. This is going to require some lifestyle changes; limiting things that trigger attacks from strain like time in front of the PC, more indirect lighting in the apartment, etc. Also a few other things like specific glasses to help in bright light situations and areas of heavy fluorescent light use. Which, I'm gonna likely need to raise money for...but we'll get to that. So, what's that mean for things here? Well, for starters, I don't see it changing my current schedule for streaming at all. Now that I know what's going on, maybe I can even manage a litle more from time to time once more management is in place. Of course, that depends on my C-PTSD issues as well. But yeah, there ya have it. That's kind of what's gone down on this episode of; "What fucked up thing is next for Vixen?" If you guys have any questions, feel free to ask on the Discord and I'll do what I can. This is still very new to me, but we'll get through this together. Again, thank you all so much for being awesome and helping me through this stuff. Well, it's true...we finally went and did it. The move happened! However, it would seem that there was a slight flaw in the process of the whole thing. Mostly that being...me. At least this is what folks are saying. Granted, I'm not saying that I did, but I very well may have pushed a button that was shiny. What happened after, that's another matter entirely. Look, you would've done it too so I don't want to hear about it! Yep, that's right, it's the official one week notice for travel! Why am I talking about this so soon? Because this is a very very big trip, without question. I'm actually going to be out í víking (on a raid) for a very long time. How long? Well, I leave on July 19th and then don't get back until somewhere in the middle of August, likely between August 12th and 18th. This trip, as detailed out in the Pennsic War page here, is huge for me. 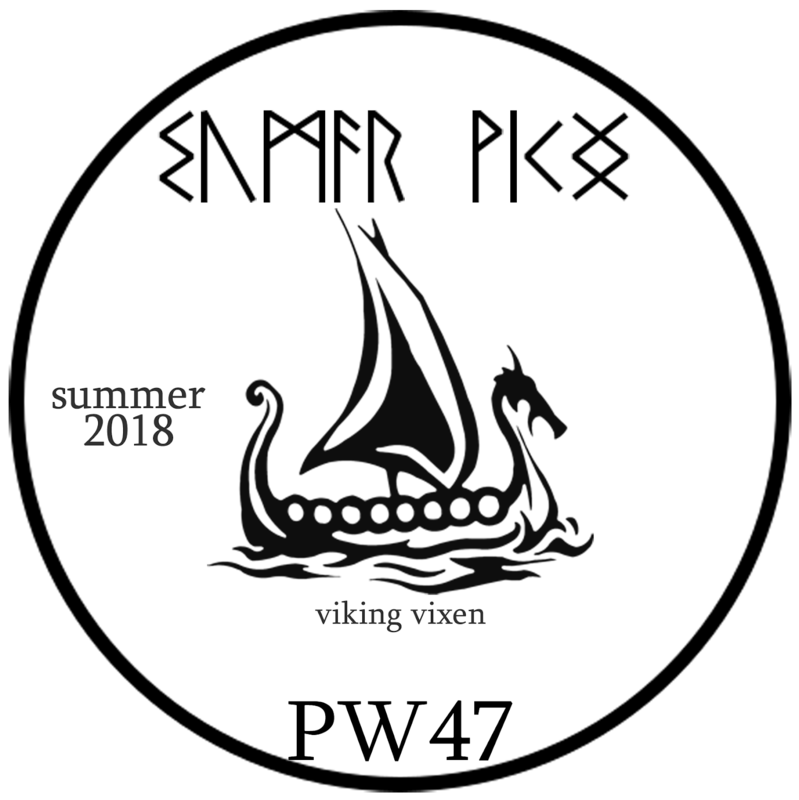 Not only is it to home, Pennsic War, but also to see my mother and brother; both that I haven't seen in nearly two years now, but also my cousin and his family that are in from Iceland. If that wasn't enough, I'm also getting my belongings from storage in the Pittsburgh area too. So, as you can see, this one is just really important all around. As we speak, the longboat is getting spruced up a bit, and all things in the gods' favor, we'll be right set to get on the road in a week. Before that though, a lot of other stuff do! What about the stream? Good question! During the trip I will be streaming, but on a more sporadic schedule and mostly when I can get signal. 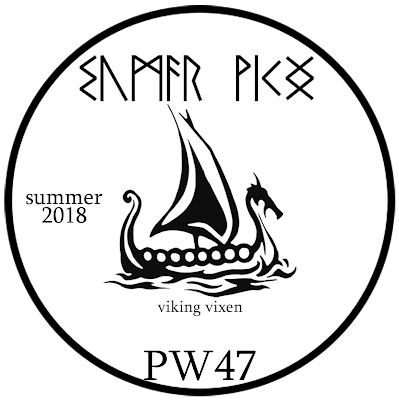 There will be very little streaming going on while I'm at Pennsic War since that is an event that I use to unplug, catch up with friends and family, and just relax. However, I will be doing at least one or two from site none-the-less. Hey everyone, just a quick note here to detail out just what's going on with the current stream schedule. Let's call them....Vixen Bites! Yes, that'll do, oh look...a logo thing! Anyway, here's what's going on with things. Main Streams: Tuesday thru Friday from about 6pm until around 11pm or Midnight Pacific time. During these streams, I'll be playing things like Skyrim, Dark Souls 3, and other story driven games. Secondary Streams: Also Tuesday thru Friday but these aren't exactly set in stone time wise. They can vary and sometimes may not happen as it depends on other things I have to do around the house. During these, I'm mostly going to be focusing on building games such as Cities: Skylines, Kerbal Space Program, Mind the Vikings and also likely to find some multiplayer games like Overwatch, Mechwarrior Online, Rainbow Six: Siege, Dead by Daylight, etc as well. So, there ya have it, the run down of just what exactly is going on here as far as that goes. 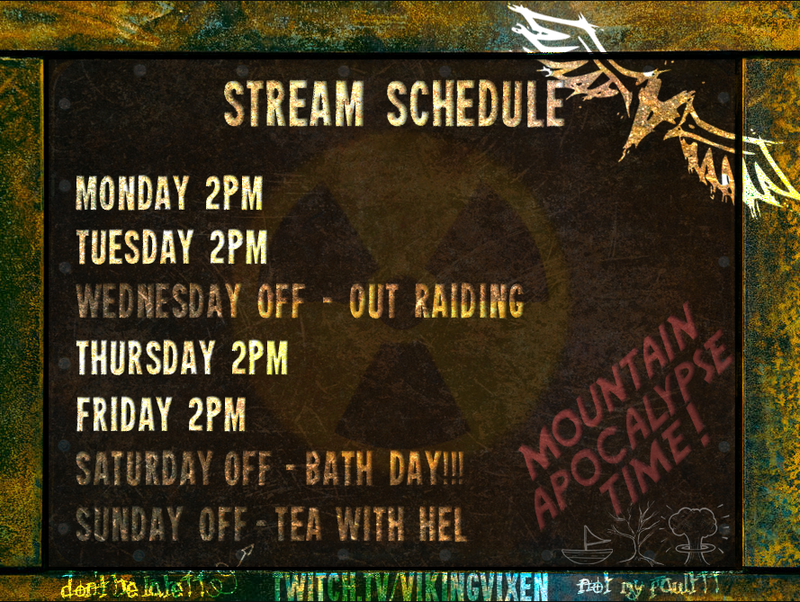 It's a little complicated but it's the way things work best with how the house schedule is currently. If there are any major changes, I'll be sure to update and of course keep track on Twitter and in the Discord for more day to day updates on things. Let's see, what else. Right! Pennsic War! It's only about 33 days until that trip kicks off, and while I won't be at Pennsic for the full time I'm gone, I will be pretty much not streaming from July 21st thru August 16th. I am working on a mobile set up that can possibly do a little something as I crisscross the country on the 3900 mile odyssey and I hope that it works out so that I can share that with you all! Time to Kick the Dust Off! So, this is gonna be a thing, of sorts. I'm not quite sure what exactly yet but it'll be for all things stream! Yep, that's right, our own little wonderland of oddness and weird. Until next time, fara heil ok vel!